Just so heart-breakingly close to winning both the Epsom Derby and Doncaster St. Leger, Savernake actually won only two races in his career. Despite a turned-out leg and the view of many German breeders that he lacked "heart," he was leading sire in Germany four times, largely supported by his noble owner. Only two of his many winning sons were of any use in the thoroughbred stud, but others were used as improvement sires on half-bred mares, and can be seen in some warmblood pedigrees. His parents were both good on the turf, but even better in the breeding shed. His sire, Stockwell, who had won both the Two Thousand Guineas and the Doncaster St. Leger, was leading sire seven times in Great Britain, and got twelve winners of seventeen classic races, including Savernake's brother, Doncaster St. Leger winner St. Albans. 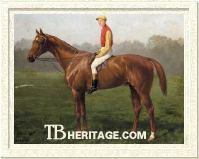 Stockwell was the most influential thoroughbred stallion of the nineteenth century, and his tail-male line is still the dominant sire line in the world today. Bribery Savernake's dam, Bribery (1851), was by Queen Anne Stakes winner The Libel, a son of Pantaloon. Bribery's dam, Splitvote (1861, by St. Luke), was also the dam of Cambridgeshire Stakes winner Knight of the Shire, and of Lady Mary (1854, by Orlando), who produced Two Thousand Guineas winner Gang Forward (1879, by Stockwell) and daughters that bred on. Bribery was bred by George Brudenell-Bruce, son of the (1st) Marquess of Ailesbury -- and later the 2nd Marquess -- and was the first good racehorse he ever owned. Trained by Alec Taylor (on the cob in the image), Bribery won small races at Ascot and Winchester and took a walk-over at Winchester as a juvenile, in five starts. At three she ran third in the Epsom Oaks, and won a minor race at Ascot, also placing second in a race there. At Winchester she won two races, and at Goodwood took the two-mile Goodwood Stakes, but ran unplaced in the Chesterfield Cup. At Brighton she was second in the Brighton Stakes, and then won the Grand Stand Stakes, her last race. Ailesbury, who succeeded to the title in 1856, was an M.P., and later served in the House of Lords. After his father's death, he was a Privy Counsellor to Queen Victoria, and twice served as Master of the Horse, as well as receiving appointment as Lord Lieutenant of Wiltshire. It was at his seat at Lockeridge House in Savernake, Wiltshire, that Bribery retired to the breeding shed. She was an excellent producer and established successful tail-female lines through her daughters Boundary and Petition. Bribery's first foal, Compromise (1855, by Alarm), won Reading's two mile Berkshire Handicap at age two. At three he was a competitive runner, placing second in the Ascot Stakes, the Goodwood Derby and York's Zetland Stakes; at age four he was sold to Count Hunyady and taken to Austria-Hungary, where he won the 1860 Kaiserpreis (royal plate equivalent) at Budapest. He later got some winners, including Verbena (1867, out of Vignette), a winner of the Nemzeti dij at Budapest, and Kaleb (1877, out of Lea), who won the Union-Rennen at the Hoppegarten in Germany. Next came Sudbury (1856, by Bay Middleton), followed by the excellent stayer St. Albans (1857, by Stockwell), whose wins included the Doncaster St. Leger, the Chester Gold Cup, and Epsom's Great Metropolitan Handicap. 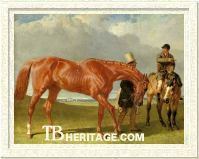 St. Albans was a consistent stallion that threw precocious, speedy juveniles and some good stayers; he was in the top ten of the leading sires several times in Great Britain, including third in 1867. His get included Springfield (1873), Royal Hunt Cup winners Valuer and Julius Ceasar, Cesarewitch winner Julius, who also placed first or second in several Cup races, Nassau Stakes winner Duchess, and other good runners. Bribery next produced Frailty (1838, by Stockwell), Beatrice (1860, by Voltigeur), and Lady Diana (1862, by Voltigeur). Of these, Beatrice, dam of 1879 Criterion Stakes winner Prestopans, continued the family line through the turn of the century, with winners in the U.S. and Great Britain. Her next foal was Savernake (1863, by Stockwell), followed by his sister Franchise (1865), who died at age three. Then came Boundary (1866, by Stockwell), dam of Coronation Stakes winner Seclusion (1886, by Hermit), whose descendants includes such horses as 1906 Oaks winner Keystone (by Persimmon) and her half-sister Doncaster St. Leger winner Keysoe (1916, by Swynford), the handsome American Preakness Stakes winner Display (1923), Deutsches Derby winner and sire Arnfried (1906), and numerous other winners. After that, Bribery produced Bridgewater (1867, by Stockwell), Scrutiny (1869, by Blair Athol), and Petition (1871, by Beadsman). Of these, Petition established a tail female line that continues to the present. Ailesbury sent Savernake to trainer John Scott at Malton. The chestnut colt was slow to come to hand, but was extremely promising. He was called "delicate" in the sporting press, probably because he turned out in one leg and Scott was reluctant to run him frequently; there were probably soundness issues. Today we would know more of him, if he had not been born in the same year as Lord Lyon, who was, said the Sporting Magazine, "about a pound better." That was all it took for Lord Lyon to beat Savernake by a head in the Epsom Derby, and by barely that in the Doncaster St. Leger. Savernake ran six times at ages three and four, and won twice. At three he started at Epsom, in the Derby, with twenty-six in the field. In the straight, Savernake passed the leader, Lord Lyon,, but Lord Lyon's jockey, Custance, used the stick at the stand, and his horse surged ahead to beat Savernake in the last stride. Ailesbury was so sure Savernake could have won that he switched jockeys for the Doncaster St. Leger. which was Savernake's next race. As in the Derby, by the time the eleven horses in the Doncaster St. Leger reached the bend in the course, it was a two horse race, with Lord Lyon in the lead, and Savernake at his heels, slowly pulling even with him, stride by stride, in the last 100 yards, "running head to head," and "nose to nose" over the distance. Lord Lyon won by "a very short head." The winner's jockey, Custance, later said "neither [Tom] Chaloner, Savernake's jockey nor myself knew which had won after passing the post...Savernake was unlucky that day; he...had to carve a route through the other horses, yet he was catching Lord Lyon, who was tiring very fast" [The race is shown above, with Savernake in the foreground, and Lord Lyon behind]. Two days later Savernake easily took the Doncaster Stakes over 1-1/2 miles, beating Rustic by three lengths, with Strathconan third. Although he was, due to the Derby and St. Leger, a well-known horse, it was actually his first win. At the fall meetings at Newmarket, he won the second year of the Triennial Produce Stakes by 1-1/2 lengths, beating Leybourne and Strathconan. On the same day he could only run third to Knight of the Crescent (whom he beat in the Derby and St. Leger), and Lothario in the Newmarket St. Leger. He came out again the next season, 1867, to run third in the Ascot Triennial Stakes, behind Dalesman and Westwick. Savernake spent one season, 1868, at stud at Hampton Court paddocks, to which Ailesbury had access as Master of the Horse, at a fee of 20 guineas. Purchsed for 3,000 guineas, a year later he was in Germany, where he spent the rest of his life, first as a stallion at the state stud at Graditz. The state stud administration was not pleased with his purchase by their agent in England -- to them, his race record indicated he didn't "have heart," and they didn't like that turned-out leg, either. In 1872 he was sold for 60,000 marks, and from 1873 to his death in 1889 he was in the stud of the Duke of Brunswick at Harzburg. The sale proved a mistake for Graditz, and a boon to the Duke. The Duke's stud of 162 acres was located at his famous Harzburg castle, about 7.5 kilometers from Goslar, on the north slope of the Harz Mountains. The stables had been established much earlier, and the Dukes of Brunswick had assiduously and successfully bred mostly half-bred horses in the late eighteenth and early nineteenth centuries. Some imported English half-bred mares, and those of other breeds, were bred to the arabian stallion Mirza (starting in 1821) and various thoroughbred stallions, producing "fine utility horses for the ducal stables in Brunswick." Just prior to the arrival of Savernake and the English-bred Apollyon, the English thoroughbred stallion The Duke of York had been used to cover half-bred mares and some nice imported English thoroughbred mares, but the breeding focused on the production of riding and cavalry horses. The stud was overseen after 1831 by the Barons von Girsewalds, a family of horsemen that served as stud directors through the 1920s. Savernake's importation, overseen by Baron Alexander von Girsewald, signalled a shift to breeding racing stock, and from then on Harzburg was devoted primarily to thoroughbred racehorse breeding, although it still produced some half-bred stock. Epsom Derby winner and leading sire Kisbér, Savernake's son, NICKEL, and the French-bred Gouverneur -- also a leading sire in Germany -- were later stallions at Harzburg. In Germany, Savernake got 93 winners of over 500 races, even though he was avoided by many breeders for some years because of that turned-out leg. Few of his foals showed that defect, most likely not genetic, and he was well patronized, even by Graditz, in later years. He was leading sire four times in Germany -- in 1873 and '74, and in 1879 and 1881. His run as leading sire was disrupted in the mid and late 1870s by the invasion of horses bred in Austria-Hungary, by the English stallions Buccaneer and Cambuscan, who had been imported to the Imperial Stud at Kisbér. Their Austro-Hungarian-bred winners made frequent forays into Germany to take the most prestigeous races, most notably Cambuscan's unbeaten, hard-racing daughter Kincsem. Savernake got several good racing sons, including HOCHSTAPLER and BROCKEN (1879), the leading earner in Germany in 1883, but most were used as improvement sires in the state and private studs. 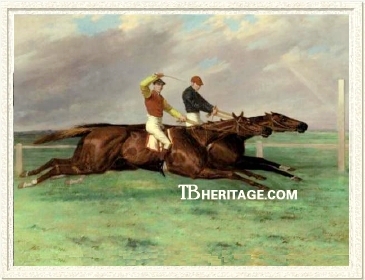 BANDIT (1887) and NICKEL(1887), bred at Harzburg, were the best of his sire sons, and as a stallion himself at Harzburg, NICKEL got some good winners and quite a few high-class steeplechasers and hurdlers. Some of Savernake's daughters were good producers -- at Harzburg they were often crossed with Epsom Derby winner Kisbér, who stood there for a few years -- and contributed to the development of German bloodlines. From his sole season in England Savernake left a couple of daughters that bred on for a few generations. In Germany, he got HOCHSTAPLER (1870, from La Traviata by West Australian) in his first crop. HOCHSTAPLER'S dam, La Traviata, had been imported to Graf Johannes Renard's Gross Strehlitz estate in Silesia as a weanling with her dam Kathleen (by Lanercost), who had run second in the 1850 Epsom Oaks. Renard bred the leading sire Flibustier, his sister Amalie von Edelreich (first filly to win the Deutsches Derby), and Henckel-Rennen winner Waisenknabe, all out of Sweet Katie, a winner of the Preis der Diana and a half-sister to La Traviata. Hochstapler Renard sent HOCHSTAPLER and his near-relative Amalie von Edelreich, both juveniles, to train and race in England. They were schooled by Joseph Hayhoe, who would train Kisbér to win the Epsom Derby. HOCHSTAPLER won a handicap sweeptstakes at the Newmarket Spring Meeting by ten lengths, which made him a favorite for the Epsom Derby. But he started in the Derby "leg tired and lame," and stumbled, knocking two horses, and went unplaced the race, won by Doncaster. Renard, who had bet heavily on HOCHSTAPLER, was in some financial distress afterwards, and left England hurridly, followed by his horses, who spent the rest of their careers racing on the continent. In Germany HOCHSTAPLER won the Union-Rennen at the Hoppegarten. In July, the best he could do was run third in the Deutsches Derby, won by his stablemate Amalie von Edelreich. In August he took the Grosser Preis von Baden (3200 meters). The following year he won the Staatspreis First Class at Budapest for his new owner, the Prussian aristocrat and industrialist Fürst Hugo Hohenlohe-Oehringen, and also won the Grosser Preis Weltausstellung in Vienna. He died early, in 1878. Another colt in the 1870 crop, bred at Graditz, was WAGEHALS (out of Vanessa, by Newminster), a half-brother to Preis der Diana winner Das Veilchen (1868, by Cavendish), who would later produce VERGISSMEINNICHT (1873) by Savernake. WAGEHALS was raced by Eduard von Oppenheim, member of a long-established Prussian banking family that had recently built Gestüt Schlenderhan, near Cologne, from whence many high-class winners would emerge in the following decades, including the brilliant Saphir. WAGEHALS' wins included the Wäldchens-Rennen (2400 meters) at Frankfurt and the Hoppegarten's Silberner Schild. VERGISSMEINNICHT, also bred at Graditz, and raced by the state stud, won the Preis der Diana; back at Graditz she produced Weltmann (1881, by Chamant), whose wins included the Ratibor-Rennen as a juvenile and the Goldene Peitsche at the Hoppegarten, later sire of Deutsches St. Leger winner Glocknerin and a number of Trakehner and East Prussian horses that bred on. Weltmann's sister Wehmut (1885), was the dam of Incroyable (1898, by Stronzian), a good stakes winner at Baden-Baden and in Austria-Hungary. Another member of this productive Graditz family, Willkur (1871, by The Wizard), a half-sister to WAGEHALS, was the dam of Savernake's son WILDSCHUTZ (1878), a winner of the Fürstenberg-Rennen and the Grosser Preis von Hannover. UNION (1870, out of St. Agnes by West Australian), became a productive broodmare: her son Tschungatai (1877, by Flibustier) won the Henckel-Rennen; daughter Marie (1879, by Laneret) won the Deutsches St. Leger, and daughter Eintracht (1886, by Recorder) took the Preis der Diana, Bad Doberan's Friedrich Franz-Rennen and the Jubilaüms Preis in Vienna at age three, and at age four won the Friedrich Franz-Rennen again and the Omnium Graditzer Gestütpreis. Neither of UNION'S good daughters were able to continue the family line. PAUL (1871, out of B Flat, by Orlando), bred at Harzburg and raced by Dr. O. Marckwald, won one race in fifteen starts, but that race was the Deutsches Derby. He was later sold to Russia as a stallion. To the cover of Savernake, his dam also produced ALPENSTOCK (1874), who ran third to Kincsem in the Berlin Criterium as a juvenile; MIZPAH (1876), and C-DUR (1883). C-DUR was third to Potrimpos in the Deutsches Derby, won the St. Leger at Baden-Baden, and the next year, 1887, won the Goldene Peitsche at the Hoppegarten. MIZPAH became the dam of Vision (1886, by Flibustier, a winner of Frankfurt's Alexander-Rennen and the Hoppegarten's Renard-Rennen; Vision later produced Vollmond (1895, by Chamant), a winner of the Deutsches St. Leger, the Silberner Schild, the Union-Rennen, the Hohenlohe-Oehringen-Rennen, Hoppegarten's Staatspries (First Class), Frankfurt's Wäldschens-Rennen, and the Hereteld-Rennen. Vollmond later got some winners, including Preller (1901), Girlamund (1901), and Pas de Quatre (1903). DONNERKEIL (1876, out of Stella), owned by Fürst Hugo Hohenlohe-Oehringen was second to Künsterlin in the Biennial Stakes at Leipziger as a juvenile, at age three was third -- to Künsterlin and Aaron -- in the Deutsches Derby and won the Wäldchens-Rennen at Frankfurt, and at four took the Goldene Peitsche at the Hoppegarten. Another colt raced by the same owner that contributed to Savernake's leading sire status in 1879 was WAIDMANNSHEIL (1877, from Katie, by Young Melbourne), who won the Zukunfts-Rennen at Baden-Baden as a juvenile; at three he ran third in the Deutsches Derby. He was later used as an improvement stallion in East Prussia, serving first at the depot at Georgenburg and then at Trakehnen, where he died in 1924. He got a number of Trakehnen and East Prussian foals. BROCKEN (1879, out of Chambermaid, by Thormanby), bred at Harzburg and owned by the partnership of trainer George Johnson and Lieutenant H. Frerichs, won the Hertefeld-Rennen at the Hoppegarten at age two, and at age three dead-heated for the Deutsches St. Leger with Marie (by Laneret). At age four his wins included the Grosser Preis von Baden and he was the leading money earner in Germany. Taken to England to race, in 1885, he won two minor races and ran second to Chiselhurst in the Liverpool Spring Cup. BROCKEN'S sister, SAVELLA (1880) went to Poland, where she was the dam of Gierdawa (1888), a winner of the Nagroda Derby and other races, and of Sulima (1890), a winner of the Nagroda Rulera. Her son Pulkozits (1900) was used as a stallion in Russia. Another 1879 Savernake colt, HARZBURG, out of the Harzburg imported English mare Relic, by Rosicrucian, won the Wäldschens-Rennen at Frankfurt (2400 meters) and the Staatspreis I Klasse at the Hoppegarten at age three. 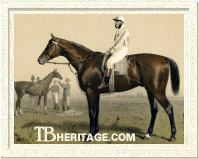 His brother, BANDIT (1887) won the Sierstorpff-Rennen and the Criterium at the Hoppegarten as a juvenile. Their sister, ALPHEDA (1882), also a broodmare at Harzburg, produced Altgold (1895, by Gouverneur), a high-class racehorse that won the Henckel-Rennen, the Preis von Thüringen at Gotha, and the Goldene Peitsche three years in a row (1899-1901). ALPHEDA was also the dam of Undolf (1893, by Kisbér), who also won the Goldene Peitsche (in 1896) and the Herzog von Ratibor-Erinnerungs-Rennen at Breslau. BANDIT, who turned out in one leg, like his sire, was put to stud at age four, and was a good stallion for H. von Treskow at his Dahlwitz stud near the Hoppegarten, getting a consistent number of winners, both on the flat and over fences, over the years: in 1904 he had 29 winners of 40 races. His offspring included Sapristi (1892, from Sorellina), a winner of Baden-Baden's Schwarzwald-Rennen at age two; Oxford (1900, out of Rhea), who took the Silberner Schild; Capril (1905, out of Lady Kendal), who took the Ratibor-Rennen at Breslau; Piccolo (1905, out of Peace), a winner of the Damen-Preis at Baden-Baden; Spaten (1906, from Son Souire), a winner of the Sierstorpff-Rennen and Hamburg's Godeffroy-Rennen; Werra (1906, out of Wachet), a good sprinter that ran through age six, that took the Eintracht-Rennen at Hamburg, the Borsteler Handicap at Hamburg and the Mongas Handicap at Hamburg. The versatile Verflixt (1904, out of Victoria) won the 1905 Schwaben-Preis at Stuttgart, a flat race, and the Haput Hurden Rennen (Berlin) and the Jagd-Rennen der Dreijahrigen (Berlin), both races over fences. Lockhahnchen (1900, from Jenny Lind) also ran on the flat, and at age four won the Hapt-Jagd-Rennen in Berlin, a steeplechase. Another foundation mare at Harzburg, Rapina (1880, by Buccaneer), born in Hungary, produced a succession of winners for Harzburg. RÄUBERHAUPTMANN (10,000 marks, Hamburger Criterium and Sierstorpff-Rennen as a juvenile), RADELSFÜHRER (6,000 marks), RAUBGRAF (10,000 marks, Hamburger Criterium, second to BANDIT in the Sierstorpff-Rennen), WICKINGER (13,000 marks, Wâldchens-Rennen at Frankfurt), and REICHSKANZLER (21,000 marks). Three more classic-winning colts by Savernake were: GHIBELLINE (1880, out of Prinzessin, by High Treason), a winner of the Henckel-Rennen; ANTAGONIST (1883, from Antias, by The Prime Minister), who took the Deutsches St. Leger for Graditz; ANARCH (1886, out of Angela, by Adventurer), another Henckel-Rennen winner. ANTOINETTE (sister to ANARCH), produced Andiamo (1896, by Gouverneur), sold to Sweden as a stallion. Nickel NICKEL (1887, out of Gold Dust, by Hermit), another classic winner by Savernake, was bred at Harzburg and raced by E. Frhr. von Furstenberg, taking 16 of his 37 starts, and placing second 16 times. His wins at age three included the Henckel-Rennen, the Grosser Preis von Hannover, the Grosses Wâldchens-Rennen at Frankfurt, and the Jubilaüms Preis Vienna. At four he won the Friderich Franz-Rennen at Bad Doberan and the Staatspries I Klasse at the Hoppegarten. The next year, 1892, he took the Grosser Hansa-Preis at Hamburg and the Silberner Schild at the Hoppegarten. His big win in 1893 was the Grosser Preis von Baden. NICKEL went back to Harzburg as a stallion, and also served a year, 1894, as a stallion for the Union Gestüt at the Hoppegarten. NICKEL's flat winners included Nicus (1898), second in the Ratibor-Rennen at the Hoppegarten as a juvenile, and at age three winner of the Union-Rennen, the Preis von Donaueschingen at Köln, and the Grosser Preis von Leipzig; Kismet (1897), whose wins included the Sierstorpff-Rennen; Firus (1900), winner of the Oktober-Preis for juveniles at Frankfurt; Monopol (1900), whose wins included the Grosser Preis von Hamburg and the Hoppegarten's Goldene Peitsche. NICKEL'S daughter, Nicosia (1895, out of Santaella, by Kisbér) was a long-running mare for von Furstenberg. Her wins included the Furstenberg-Rennen and the Preis von Schleisien at Breslau at age three, and the Grosser Sachsenpreis at Dresden. She bred horses that won on the flat, but mostly over fences. Her son Erberich (1905, by Calveley) won the Landsberg-Jagd-Rennen at Munster. His brother, Calvello (1904), started as a flat racer for Kurt von Trepper-Laski, placing third in the Preis des Winterfavoriten at Köln as a juvenile, and at age three was third in Hamburg's Nickel-Rennen, the Borsteler Gold-Pokal, and the Grosser Preis von Leipzig. After that, he was put to jumping, and in 1910 took the Colonia-Jagd-Rennen (Köln), the Gladiatore-Preis at Berlin. In 1911 he won the Gladiatore-Preis again, and the Funftausendstes-Rennen at Berlin, and was second in the Germania-Jagdrennen at Berlin, and also won a flat race, the Omnium der Steher at the Hoppegarten. Nicosia's daughter, Nissa (1907, by Ard Patrick), also put to jumping, won the 1912 Westfalia Jagdrennen at Gelsenkirchen-Horse and was second that year in the Grosser Preis von Bielefeld, and in 1913 took the Landsberg Jagd-Rennen at Munster. Nicosia's 1910 foal, Nikias (by Festino), raced on the flat for the Weinberg brothers, placing in many races and winning the Prinz Hermann von Sachen-Weimar Memorial at Baden-Baden. NICKEL'S jumpers included Nickelkonig (1903), a winner of the Landsberg Jagd-Rennen at Munster; Beethoven, who took the Kronprinzen-Preis at Magdeburg, and Thu Mir Nix (1901), a winner of the Berolina Jagdrennen. ©1997 - 2011 Thoroughbred Heritage. All rights reserved.